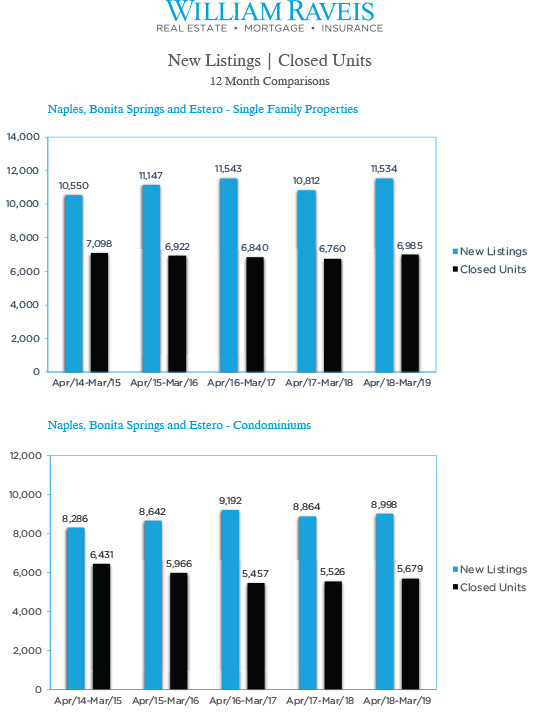 The number of closed sales in the 12 months ending March 31, 2019 for the Naples, Bonita Springs and Estero area increased 3% year-over-year (6,985 vs 6,760). There were 38 closed sales, priced above two million, in March 2019 compared to 52 in March 2018 a 37% decrease. During the 12 months ending March 31, 2019, sales in this category increased 5% over the same time period in 2018 (393 vs 373). During the 12 months ending March 31, 2019, a total of 11,534 new listings were added to the market, this is 7% more listings than the same time period, 12 months ending March 31, 2018. Available inventory as of March 31, 2019 consisted of 6,142 units, an increase of 6% vs the same time period in 2018. Current inventory represents 11 months of supply based on current absorption rates. The year-over-year average sales price for the area was $673,572 which improved over the same time period in 2018, representing an increase of 5%. The median sales price for the area decreased 3% to $382,020 vs $395,000 in 2018. 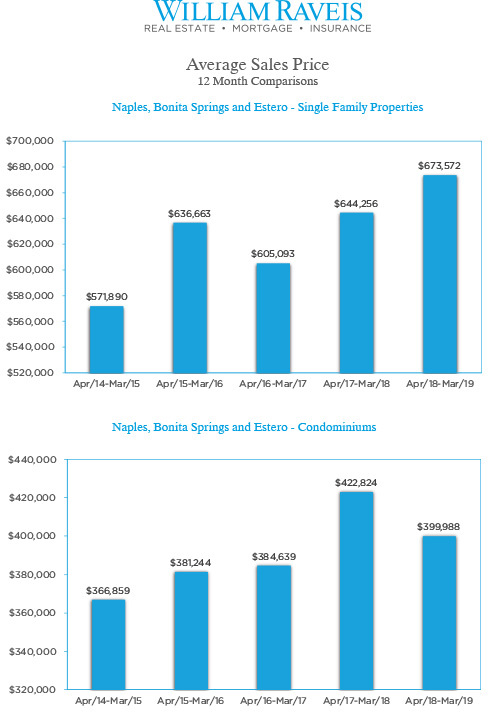 The number of closed sales in the 12 months ending March 31, 2019 for the Naples, Bonita Springs and Estero area increased 3% year-over-year (5,679 vs 5,526). There were 14 closed sales, priced above two million, in March 2019 compared to 15 in March 2018 a 7% decrease. During the 12 months ending March 31, 2019, sales in this category decreased 16% over the same time period in 2018 (153 vs 128 units). During the 12 months ending March 31, 2019, a total of 8,993 new listings were added to the market, approximately 1% more listings than the same time period 12 months ending March 31, 2018. Available inventory as of March 31, 2019 consisted of 5,059 units, an decrease of 1% vs the same time period in 2018. Current inventory represents 11 months of supply based on current absorption rate. The year-over-year average sales price for the area was $399,988, a decrease of 5% vs the same time period in 2018. The median sales price for the area decreased 1% to $263,000 vs $264,900 in 2018.